Senior Dimitri Staszewski in Mongolia. 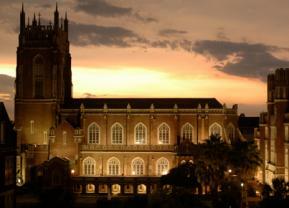 View the complete issue offall 2013 LOYNO Magazine. 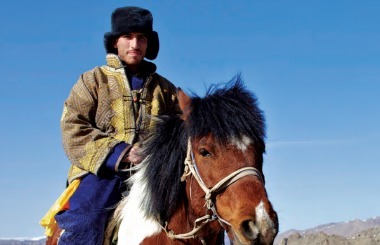 When Loyola University New Orleans senior music industry studies major Dimitri Staszewski began his academic career four years ago, he never imagined he would travel 7,000 miles across the globe on a quest to document the changing musical traditions of Mongolian herders. But the aspiring filmmaker recently spent four months traveling back and forth between Mongolia’s capital city, Ulaanbaatar, and the Mongolian countryside, filming and experiencing firsthand the culture he’d previously only read about. His more than 20 hours of footage preserves examples of the music of one of the world’s last surviving nomadic cultures and one of the largest nomadic populations in the world. More than half of the Mongolian population has already shifted away from traditionally nomadic lifestyles, according to Staszewski. After a sophomore semester backpacking throughout the southwest United States, Staszewski began exploring the idea of how people not only choose to live but actually do live throughout the world. One year and hours of research later, the California native embarked on his journey to Mongolia. He set off with the idea to film a documentary about the disappearance of the country’s traditional music of herders and the consequences for Mongolian culture as a whole. During his stay with a nomadic family in the Mongolian countryside, Staszewski spent time herding, sheep wrangling, and interviewing the locals. The most memorable moments happened when he was recording their musical performances. “My goal is to showcase a side of traditional Mongolian music that I feel is currently underrepresented,” Staszewski says.